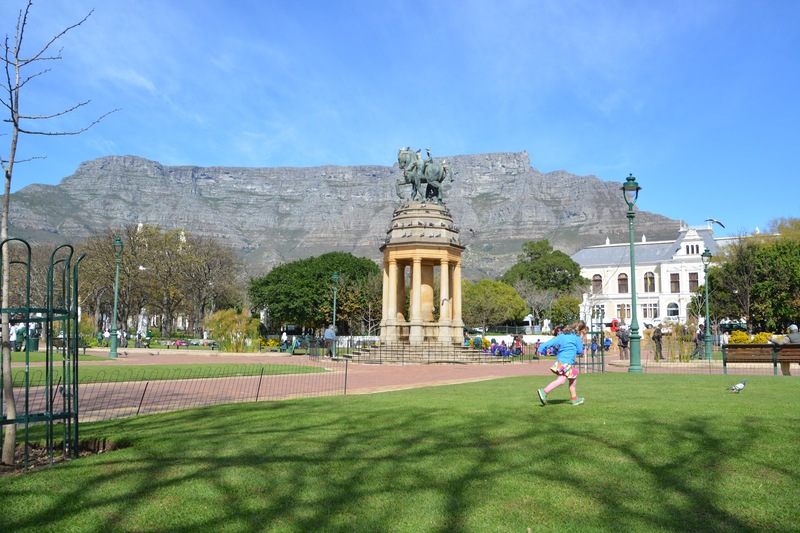 We’ve spent the past 7 days in Cape Town, also known as the “Mother city” for its role in the development of modern South Africa, and exploring down the Cape peninsula. Cape Town the city itself is absolutely impressive, with the domineering sheer cliffs of Table Mountain, Lion’s Peak, and Signal Mountain hovering over us at all times. It was initially a bit disorienting to have the city wrap around the spine of the mountains, but it quickly becomes the central navigation tool. The sun is cropped at different angles and creates beautiful patterns when the sun dips below the table at any point. Of course, taking the cable car up to the top of Table mountain is #1 on any visitors list of things to do. Of course, the week we visited was the week of annual repair for said cable car. We’ll leave this, like I have the Sistine chapel on many trips to Rome, on our list for the next time we visit Cape Town. The city bowl proper is reminiscent of Market street and North of Market in San Francisco. Throw in a significant number of small design boutiques that take you by surprise (both in location and with innovative and noteworthy interior design), and you can start to envision the vibe. As we explored further afield, venturing into the industrial Woodstock area (beyond the train tracks), we began to realize that there is no end to the number of contemporary design shops and purist coffee roasting shops nestled between kitchen supply stores and tire shops, or tucked neatly behind petrol stations, sewing stations, and open markets. We sampled some high end chocolates from a chocolatier with original paintings on the walls for the chocolate wrappers in the most unlikely street setting. 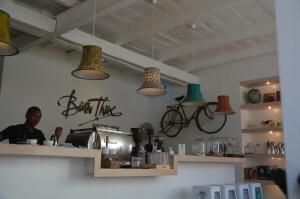 We found cafe after cafe that would be the stars of 3rd St or Melrose in LA, but are the de facto norm in Cape Town. Rusty old pedal bikes adorn many of the shops- the only common design trend I can remark upon. Another fantastic Cafe! With fashionable Bike. 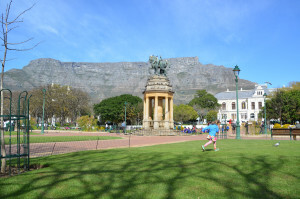 We meandered through town, two strollers in tow to cover more ground, checking out some boutiques, coffee houses, and the Company’s gardens (Cape Town’s main park, similar to the Mall in DC, but much, much smaller). We ate at a truly phenomenal hole in the wall, The Kitchen, in Woodstock. Apparently Michelle Obama forwent all the up-market establishments to eat there on her last trip to Cape Town- it was definitely worth all the rage. We had a smattering of exceptionally good salads and hands down the best sandwich Staffan or I have ever had. I cannot emphasize that enough, so I will simply write it again: it was the best damn sandwich either of us had ever tasted. I miss it terribly, and wish we could re-eat it. It is a taste memory that will live with me forever, similar to my first baguette in Paris in 1996 that I can not only still taste, but feel the crust of and the small round nubbins on the nether side of… it is no wonder Staffan and I make such a good pair: my love for food and his love of innovative cooking rival each other in extremes. 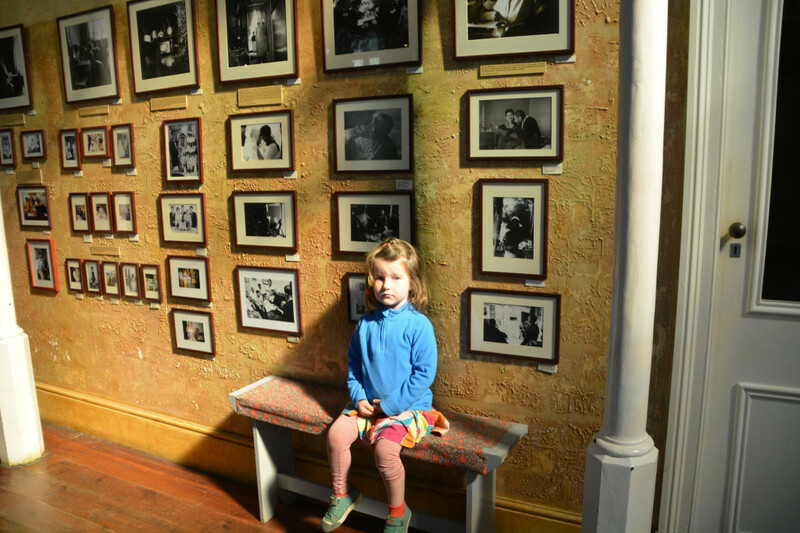 We then took some time to look into the District Six museum which pays homage to the masses of people driven out of their homes in the 50’s in a move to “clean up” the city, a move that had the effect of mass displacement for the non-white communities during Apartheid. This displacement effort hit all areas of South Africa, and only now are the areas becoming re-settled. I did a pretty horrible job with accommodations for this leg- all I can say is that I now know that my OCD for perfect accommodations within any price range is well worth the effort I normally put in; until now I have always wondered if it wasn’t just a waste. We are staying in a one bedroom apartment that is perhaps the poorest design of space utilization one could possibly imagine. It could be an intro to interior design student’s final exam- to name all the wrongly positioned elements, poorly crafted or placed features, etc. Needless to say, Staffan is irked, and I am no better. It is in a newly developing (or newly gentrifying?) 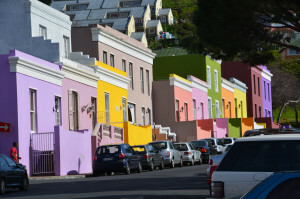 area, Green Point, and the downtown, the waterfront, as well as the brightly colored Bo Kaap district are within a 5-10 minute walk. The redeemer is that right outside our apartment we have the communal gym outfitted with a lap pool and some reasonable equipment- so we can exercise and wear the kids’ energy down- but the moist air has no barrier from the apartment, keeping us in a damp, cold state as we are at the tail end of winter down here. Two of the 7 nights we spent here we were awakened to robberies or crimes of some sort, with yelling, the pitter patter of running, and getaway cars screeching off down the street. Still, we felt safe at all times during our stay, but we were pretty conservative and aware at nights. ← The great pause settles in!